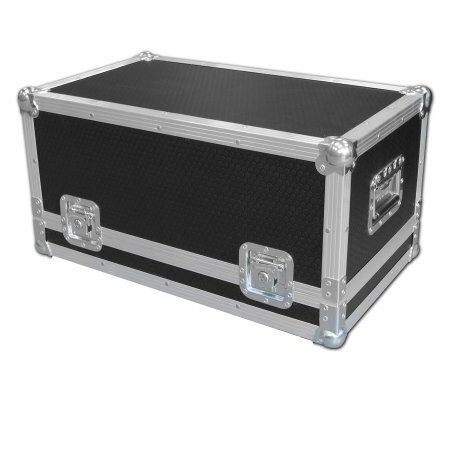 The Flightcase Warehouse Amp-head case is a custom built flight case designed to protect your Amp-head whilst on the road. This flight case is designed in house by our design team and manufactured using Penn Hardware with ultra strong hexaboard panels. All of our cases are designed and built around the Amp to ensure maximum protection while keeping to the minimum size, which means the case is no bigger than it needs to be. Bass Guitar Amp Flight Case for Hiwatt 400w Head 4.84615384615385 out of 5 based on 52 ratings. 52 user reviews. Good quality hardware and finish. Built to last rugged and accessible. WispA The Drones. To the guys a big thank you for making the flightcase for my Ampeg SVT610,superb communication and support. Along with the case you made for my Ampeg SVT1000,i have peace of mind that my gear is protected. I ordered two head cases, one for a Hiwatt and one for my Marshall. The cases embrace perfectly the amps and are very well made. Great job and great costumer assistance. Excellent quality. Fits the amp perfectly. Flight cases arrived earlier than expected. Great service. Will work with flightcase warehouse again in the future. Very helpful staff. I requested that wheels be added, no problem. Flight case arrived when they said it would. Does the job, very sturdy. Very helpful contact since I am not an amp expert! fast and efficient service! Excellent case, customer service and delivery!! Went out of their way to make sure my case was delivered on time for the start of my tour. Incredible service, fantastic product, fast delivery. PERFECT! Excellent fast service from FCW. Fast communication to add casters to a case for my Ampeg Head. Solid, high quality case. Definitely recommend. Ashdown ABM 900 case. Simply perfect! All perfect apart from wrongly measured depth, but all sorted. I am very happy with my order thank you. Fantastic high quality amplifier case, and fits perfectly, I couldn't ask for any better. Excellent quality. Shame it took alittle longer for delivery. But worth the wait. Fully as expected. Sturdy case, perfect fit. Swift communication up until the moment it had arrived. Couldnt think of anything other than positive to say. excellent service ordered for my son for xmas but didn't realise that the case would take 2-3 weeks to prepare! e-mailed my dilemma and was reassured that the case would be with me before xmas which it was. well done! Received my flightcase today, it's great, built like a tank - really pleased with it. No need to worry about the amp getting knocked about now. These guys make great cases and I'd certainly come back to them again! ...great product,great service and great price...what else is needed in this day and age....we will certainly be buying more flightcases from you guys...keep up the good work Animal....Anti Nowhere League. Arrived promptly and is very well built! Strongly recommend this to keep your amp safe. I no longer need to worry about transporting it in my shaky car! Perfect ... Exact dimensions, fits and protects the amp perfectly ! Just received case, everything looks gr8 thanks guys! helpful and fast ordered and got it just over a week later! Awesome flight case, arrived on time and ready for touring! Took a little longer than anticipated but a good quality case at a great price. Also a nice fit. Got mine in the mail yesterday, just in time as i was about to leave for a gig. It seems to be pretty solid, and it sure fits perfectly. Only thing is, it had some dings and scratches on it (minor) coming out of the wrapping that i dont think could have come from the shipping. It's a pretty lightweight case, and time will tell how its gonna hold up to abuse on the road, but i've got a pretty good feeling about that. Yet again Jase and the boys deliver a Premium Quality case, EXACTLY to my specs, EXACTLY on time. This is the 8th case from FW, Why would anyone want to go anywhere else?? Well I guess it all has been said already ... great cases, perfect fit - just love 'em! Good job!! Great case, head fits perfectly, thanks very much. As the others review: Great quality and it fits perfectly!! For the French people: Un flight case de grande qualité n'hésitez pas!!! Great work guys! Thanks a lot for this awesome case! Good price !!! Fits perfectly and arrived on time - no complaints. Well Done! Excellent build quality, fits perfectly and looks great! It is the third such case I have bought from these guys and would have no hesitation in recommending their flight cases. Nice communication, serious and good product. The case is perfect!! Good job!! !